In this article, you can find and download Dream League Soccer (DLS) Wolfsburg Kits and Logos 2018, 2019 Edition with URLs. Wolfsburg is a professional football club from Germany. It plays the top division German football i.e., Bundesliga. It is one of the tough leagues to compete in and Wolfsburg is also a very tough team. The club was founded on 12 September 1945, 73 years ago. Volkswagen Arena is the home ground of Wolfsburg. The team plays all its home matches of different competitions on this ground. The Stadium has a capacity of 30,000 visitors. Bruno Labbadia is the head coach of this dynamic Wolfsburg side. Underestimating them is one of the big mistakes you can do. To play with Wolfsburg’s kit in the Dream League Soccer, you have to download the kits from the URLs provided below. In Dream League Soccer you can change the kits and logos of your team. In order to do that you will need the URL of the kits to download. So in this post, we are providing the Dream League Soccer Wolfsburg kits and logo to download and play. The kits are in the size of 512×512. 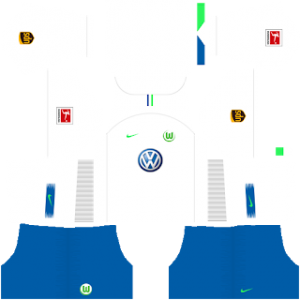 You can use this kits in DLS by clicking the URL to download the Wolfsburg team home kit 2018-2019. 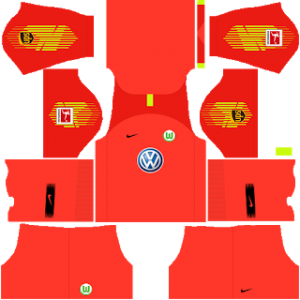 You can use this kits in DLS by clicking the URL to download the Wolfsburg team away kit 2018-2019. 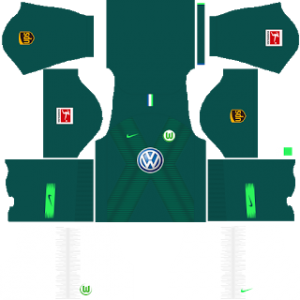 You can use this kits in DLS by clicking the URL to download the Wolfsburg team Goalkeeper’s home kit 2018-2019. 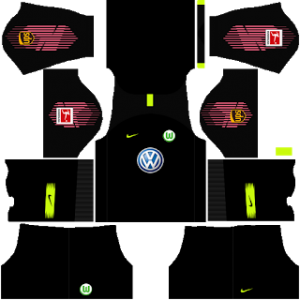 You can use this kits in DLS by clicking the URL to download the Wolfsburg team Goalkeeper’s away kit 2018-2019. You can use this Logo in DLS by clicking the URL to download Wolfsburg Logo 2018 – 2019. Feel free to share your reviews about the Dream League Soccer Wolfsburg kits for the 2018 – 2019 season in the comments section below.